Nothing like a Third Intifada to regain the World’s Empathy! You are here: Home / Antisemitism / Nothing like a Third Intifada to regain the World’s Empathy! On Wednesday September 30th, Palestinian Authority leader, Mahmoud Abbas delivered his annual speech to the United Nations General Assembly. It had been advertised for weeks as a “bombshell.” Apparently, Mr. Abbas wanted to stir the pot ahead of his yearly opportunity to lambaste Israel in front of a global audience at the UN. It looked like Mr. Abbas was grasping for straws. But you can always count on the bias of our liberal media to stir the pot further as many of them bought Mr. Abbas toothless threat, hook, line and sinker. • Associated Press: Palestinian leader declares he is no longer bound by agreements signed with Israel. • The New York Times: Mahmoud Abbas, at U.N., Says Palestinians Are No Longer Bound by Oslo Accords. 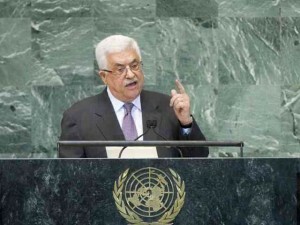 Frankly, I believe that Mahmoud Abbas was pouting at the UN General Assembly. If it was not for the fact that later on the UN raised the Palestinian flag along with the Vatican flag for the first time ever –booth entities have official observer status–Abbas would have had a temper tantrum. There is no question that Mr. Abbas’ latest threat can still be considered a repudiation of peace, even if it is an empty threat because it clearly shows his heart. But He is tired of playing second fiddle to other Middle East terror virtuosos. The Palestinian struggle has been losing momentum in recent weeks, being replaced in the news by other crisis that deserve our attention. The following list is a brief overview of what has kept Abbas out of his cherished international limelight. • ISIS continues to spread throughout the region, terrorizing Christian, Jews and Muslims alike as they indiscriminately behead those in their way of a caliphate. • Iran is rapidly becoming a nuclear threat to the entire region. By the way, if they bomb Israel, will the nuclear holocaust stop short of leveling out Gaza and the West Bank? Of course not! Iran is also a threat to the Palestinian Authority, even if they ignore it. • Syria’s civil war and its recent Russian incursion, including some military actions is definitely further destabilizing the region. Mr. Abbas’s had the chutzpah to propose the annulment of the Oslo Accords, pointing the finger at Israel. It is akin to having Hitler make the statement that he would not dialogue with the Jewish community because of their crimes against the Germans. Ludicrous of course. The only difference is that 75 years ago, it would never fly but today, most of the world chooses to side with the Palestinians. Mr. Abbas knows it and he is banking on it to further his agenda. He also knows that if he wants to retain his credibility within the Palestinian circles, he must make the news again, and in a bigger way. We have seen some rock throwing activity from the Temple mount in recent weeks as well as physical harassment in the old city against Jews on their way to the Western Wall for Holy Days prayers. Mr. Abbas probably thinks that now would be the ideal time for a third intifada (uprising). Mr Abbas is pouting because to a certain extent the world isn’t really paying attention to him as much as he would like it. But cancelling the Oslo Accords would also force the Palestinian Authority to dismantle and would eradicate all the credibility–as undeserved as it may be– that they have built over the years. He cannot afford to make that move. A third Intifada on the other hand, would provide Mr. Abbas with the fuel he needs to revive his campaign of Jew-hatred. Even though in direct contradiction with real facts and the truth, Palestinian victimization and Israel’s demonization would most certainly draw the attention of a world audience so enamored with tolerance and social justice. Not to mention that he is even losing popularity within his own people. The very people sick of Abbas’ failures who are also pushing for another armed intifada. The next few weeks will tell us if Israel will soon be faced with another Palestinian uprising. With ISIS pushing from the north, the Gaza Strip and the Sinai Peninsula; Iran putting the final touch to its nuclear arsenal and Russia coming to Assad’s rescue in Syria, that is a very full plate for Benjamin Netanyahu. A third Intifada would complicate things for Israel but we must not forget that even if the world finds favor with Mahmoud Abbas, God holds Israel in the palm of his hand. Regardless of the many people in Israel who do not believe in God, that does mean that God doesn’t believe in Israel. Israel is nothing but a big bully, pushing around and encroaching other nations? Fire rockets at Israel and they’ll just accept it? Throw rocks or stab Israelis, not an issue? Israel doesn’t want peace? The “politically correct” world accepts these questionable statements, but refuse to look for the TRUTH. Defending and retaliating against attack is recognized around the world, unless it’s Israel. With all the amazing technology coming out of Israel, can you imagine the world if Peace could happen? Mr. Abbas is playing with fire, and the end result will be getting burnt.